Earlier this year, Gartner published their 2018 Magic Quadrant for Analytics and Business Intelligence Platforms mentioning the trend of upgrading traditional solutions as well as expanding portfolios with new vendors as the market innovates on ease of use and augmented analytics. With top BI vendors – Tableau, Microsoft and Qlik have little changes in positions and statuses. There is a significant shift in the Niche Players and Visionaries quadrant, namely Birst, Oracle and IBM. Retain their position as the preeminent one among the three names in the Leaders quadrant, thanks to the strong adoption of Power BI, and customer’s ongoing favour and interest in Microsoft’s products. Within 2017, they continued to improve and introduce multiple new products such as Power BI Report Server for sharing reports and Power BI Premium – the upgraded version of their Power BI Pro. Microsoft has proven that they sustain a clear and visionary product roadmap that includes vertical industry content. Microsoft's customer reference scores place them in the top quartile for ease of use and visual appeal. Knowing how to leave imprints on their customer experience, Microsoft focuses deeply on cloud deployment and user enablement while maintaining their affordable price. With plenty of development and new applications based on their Power BI, for example, Microsoft Surface Hub to supports the display of Power BI content, or the integration of Power BI with Microsoft Flow, Microsoft continues to develop their product vision, hence strengthens their position as a leader. Microsoft's scores from its reference clients place them in the bottom quartile for the breadth of use. More than half of Microsoft’s users use Power BI's parameterised reports and dashboards rather than using it for more complex tasks. Besides, Power BI being limited to Mode 2 analytics, Azure cloud only makes it complicated for users who work on both cloud and on-premises platforms. Continuing to promote their easy-to-use, visual-based exploration experience that allows any user to access, prepare, analyse and present findings in their data, needless of technical skills or coding. Tableau has set the bar for the modern analytics and BI market.  They make sure that their products are able to support users from all across the enterprise to explore and find insights in data without any hardship. In January 2018, Tableau released their new Hyper in-memory engine and shifted their strategy toward large enterprise deployments and sales. 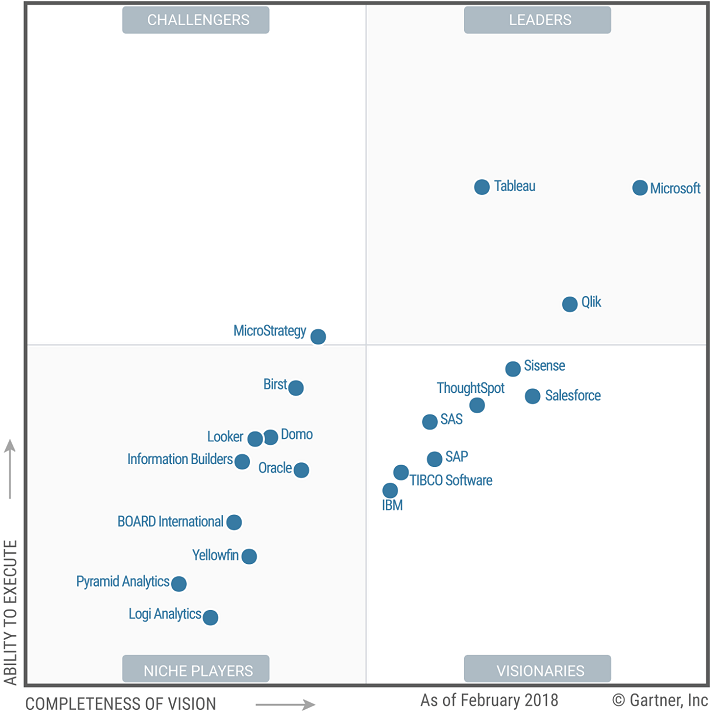 Tableau succeeded in keeping their position in the top 3 Leading quadrant. Strong market momentum in an increasingly competitive and price-sensitive market, ongoing product improvements, and excellent customer reference scores for customer experience and success helps position Tableau in the leading group. Their biggest strengths continued to be the intuitive interactive visualisation and exploration features and supporting analytic dashboarding on almost any data source. Tableau values customer experience and success – proven through their reference customer scores: top quartile score for the achievement of business benefits and highest score for user enablement. Tableau was early to adopt Cloud, that’s why it can be deployed on both cloud and on-premises. They also expanded deployments and standardisation rates, which result in most of their reference customers consider the platform to be either "one of" (36%) or "the" (52%) enterprise standard. Although Tableau’s ability to provide visual-based data exploration is still a differentiator in the market, it is becoming more mainstream as other vendors are also offering this type of feature. In addition, it is time for Tableau to step up their game to keep up with the innovative startups and larger vendors as the competition in prices and innovation in product vision are getting more intense. As stated by Gartner, “By 2020, organisations that offer users access to a curated catalogue of internal and external data will derive twice as much business value from analytics investments as those that do not.” Therefore, the ability to connect between platforms and networks is highly valuable in the future. Modern analytics and business intelligence platforms represent mainstream buying, with deployments increasingly cloud-based. We are at the stage of a new wave of disruption: augmented analytics, along with machine learning generating insights on increasingly vast amounts of data. Vendors that have augmented analytics as a differentiator will dominate the business intelligence, analytics and data science and machine learning platforms and of embedded analytics in the future. Although positioned in the Niche Players quadrant, Birst’s potential has just ignited since it was acquired by Infor in 2017. 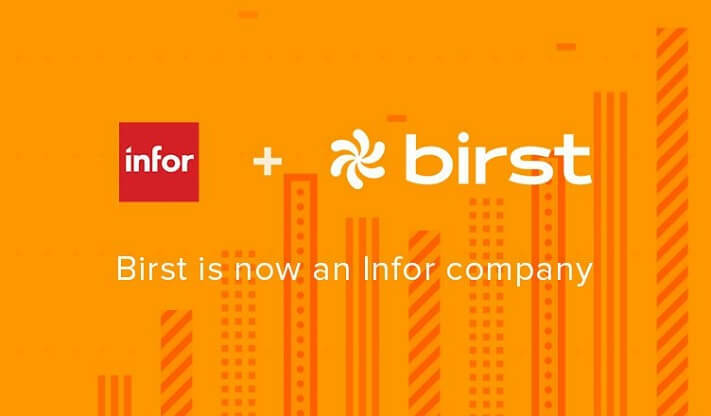 Now operating as an independent business unit of Infor, Birst provides cloud-based, networked business analytics platform. Birst offers enterprises with a solution – a cloud-scale architecture built on top of a modern, multi-tenant platform that delivers analytics significantly faster and with far fewer resources. Additionally, Birst allows users to dive deep into their analytics, data models and visualisations through a seamless, networked integration of data and analytics deployments across the organisations. Birst stands out from others platform with its wide range of data sources analysed. From on-premises to Cloud, enabling both centralised and decentralised analytics, plus, supporting both Mode 1 and Mode 2 usage styles on a single platform. Birst’s users are given all kinds of approaches to process data, from data preparation to dashboards to scheduled, formatted report distribution, allowing customers to access and merge multiple data sources while still providing governance. Transforming them to enterprise standard for analytics and BI in most of their reference customer’s eyes. Another reason why customers choose Birst is their Cloud Deployment and low total cost of ownership. Birst had the highest proportion of reference customers who said there were no limits to further deployment within their company. Nevertheless, Birst still possesses multiple weak points, such as low scores in market understanding and customer experience. Moreover, Birst needs to fill the gap in their product roadmap in order to keep up with the next wave of disruption – the implication of the insights generated. Subscribe to our Blog to stay informed or request a free and tailored Business Intelligence and Analytics Demo for your business today.